The Leviton SMC-280 and SMC-420 bring the home or small office on the cutting edge of technology by bringing every conceivable technology distrubution point together in one place. They make running cable and managing media both simple and more cost effective. Designed to incorporate a hospital-grade power quality module for maximum protection from line surges, the 28" and 42" high units accommodate all the latest in functions such as home networking, fax, internet (including high speed services such as DSL, cable modems and ISDN), multi-line telephones, security camera, coaxial cable and satellite video distribution, and speaker and volume controls, when equipped with the correct accessories. 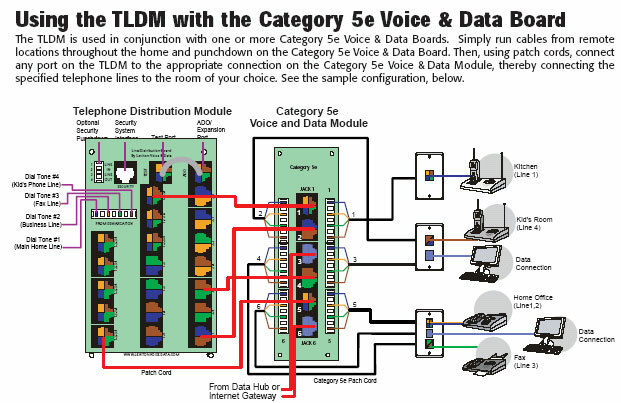 Category 5e Voice and Data Module whose six Category 5 or 5e ports allow for basic home networking (data, phone, fax or modem) and can be connected to a Telephone Distribution Module, key system, or network hub.